We're throwing together a last minute #AlaBlogMeet because, well, we just like hanging out. So if you would like to join us, we would be honored! We're meeting on Friday, July 27 at 11:30 at Jim N Nicks Homewood. If you can come, RSVP on this post!! Carol Marks @ Carol Marks Online and Girl Gad About (Twitter: @camarks, @RocketCityBlogs) - Carol is a blogger that has been around before any of us knew what bloggers were. A true pioneer in the field, she shares her life beautifully and eloquently. She resides in Huntsville and is an avid promoter of blogger networking in her city. Buddy @ The Cobalt Club (Twitter: @BhamProfile, @TheCobaltClub) - Buddy is a storyteller, and a very good one at that. He will pull you into his tales and leave you wanting to know more. Micha @ Cookin' Mimi and Small Town Pilgrim (Twitter: @tiamimi) - Micha is a true small-town Alabama girl. She offers fabulous recipes, thoughts, and tips. Her genuine kindness comes through in her blog and on twitter. For a long time, I've wanted to start a series about the best food in Alabama. Who has the best fries? The best ranch dressing? The best chocolate cake? The idea was to post my own findings, let everyone weigh in their own favorite of that particular item, and if anyone had a specific category that they would like to feature, offer the opportunity for guest posts. This idea came from the subject of this first post: the best hamburger in Alabama. Because sometimes, the best discoveries are in the most unexpected places. I didn't try this hamburger for years, despite my longtime dining habit at it's home. Mainly because I'd never considered getting a burger there - after all, it was a place of Mediterranean delights - why would I get a hamburger? But thank goodness for my husband, who is never afraid to try the hamburger anywhere. From the second I laid eyes on his order (and most certainly after I'd swindled more than one bite from his plate), I knew I'd found the best hamburger in Alabama. The Bifteki at Nabeel's Cafe and Market. We first tried it a few years ago, and have probably eaten half the Biftekis that they've served in total since. The Bifteki is special because it is most definitely a Greek Hamburger. It isn't lamb, though - it's beef. So don't get scared off if you're afraid to eat cute, furry things that say baaa. The beef is seasoned with Greek oregano, stuffed with Feta cheese, and topped (and sided) with Kefalograviera cheese. For garnishment you're provided the normal fixings - onions, tomatoes, and lettuce, and you are also rewarded with tzatziki sauce and greek dressing. Here's the way to fix it right: add the vegetables that you want, then smear the bun with the entire offering of tzatziki. I don't normally say this about a hamburger, but skip the ketchup entirely. Put the burger together, then dip it into the Greek dressing before each bite. Your mouth will thank you. The richness of this burger is unspeakable. The moistness added by having the feta inside the burger is hard to beat, and the offsetting tartness of the Greek dressing is phenomenal. The fries are also outstanding, seasoned with Greek spices and cooked just right. And they're also delicious when dipped in the Greek dressing. And here's a bonus tip: Ask to sit in Lynne's section. She's the best waitress in Alabama. Who wouldn't want to have the best burger served by the best waitress? Do you have a contribution to the Best in Alabama? 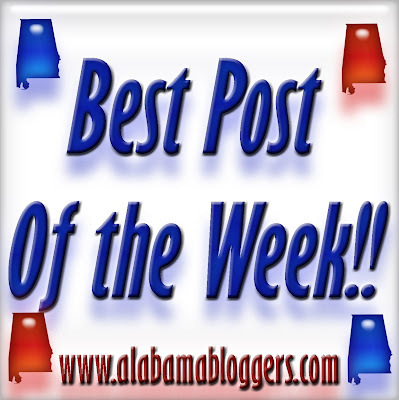 If you would like to guest post or make a suggestion for a place to visit, comment on the post, or email me at rachel@alabamabloggers.com. This week's See For Yourself is blatant nepotism. Just so you know. My Dad, Vic Zannis, just started a blog called A Lap of Alabama. He's never been one to shy away from an adventure, including a 45 day race from Beijing to Paris in a 1950 Ford, multiple races through the entire length of Mexico in antique cars, and traveling five days across country in a truck with three kids and his Mother-in-Law - three times. For their 40th wedding anniversary, my parents are going to be traveling in a 1930 Model A Ford around the perimeter of the entire state of Alabama. Their rules are simple: no interstates, no chain hotels, and no fast food. Their goal is to visit some of the more unique and unknown sights in Alabama and in the neighboring states. Dad is currently in the rebuilding stage, preparing the Model A for their extended travels. They are also working on their route, and are looking for suggestions on what sights they should see and where they should stay. He will be blogging the planning and executing of their entire adventure on his new blog, and if he starts to fade in his blogging determination, you know that I'll be there to pitch a childlike fit and force him to sit down and write. So head over to his new blog and read about their trip, and be sure to let him know of any suggestions that you have for places to visit, stay, or eat. 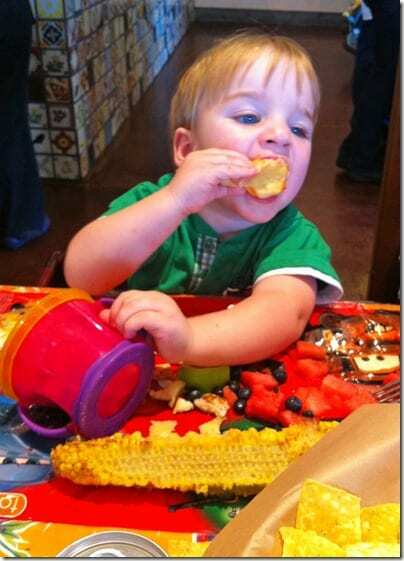 Homewood's Little Donkey Serves Both Fresh Food and Ideas. We’re the type of family that likes to wait until the hype dies down to visit a new restaurant. We don’t like waiting for a table, and we’re also okay with being the last to try something new. However, I’ve been desperately wanting to try Little Donkey since learning about their local pork sourcing and their use of only fresh, made-from-scratch ingredients while at the Atlanta Food and Wine Festival. We finally had the opportunity to visit last Saturday for lunch. We were a bit nervous about having to wait since we arrived at noon. But much to our delight, they seated us immediately. Five seconds later, we were gifted with a basket of chips and a large bowl of salsa. 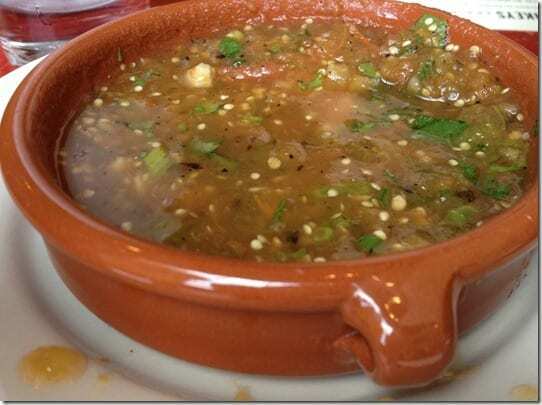 I adored the salsa. I’m in a committed and loving relationship with cilantro, and they are quite generous with it. It wasn’t too spicy, which I also appreciated. 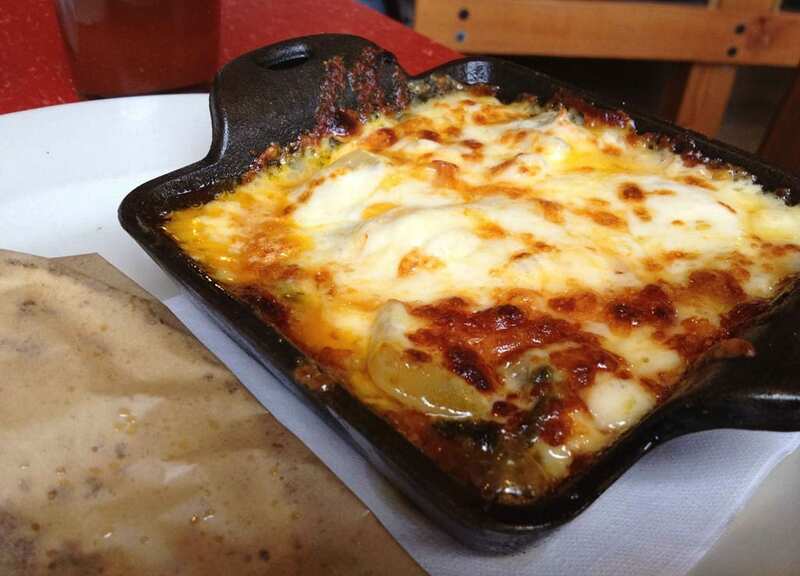 We tried their Queso Fundido, which was still bubbling when it came to the table. It had a thick layer of cheese over chorizo, and was served with their handmade tortillas. 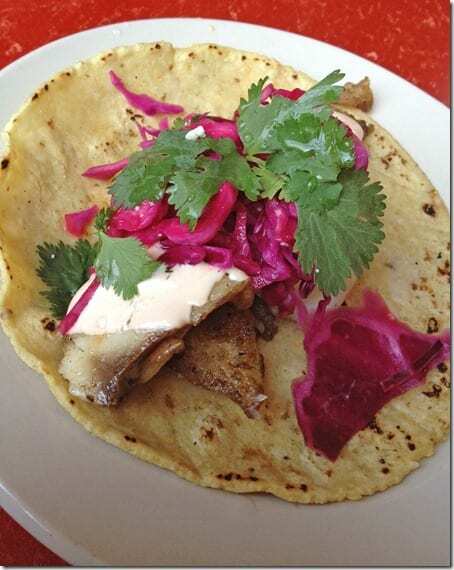 I loved their tortillas and the rich flavors of this dish, and my husband and I easily finished it off. 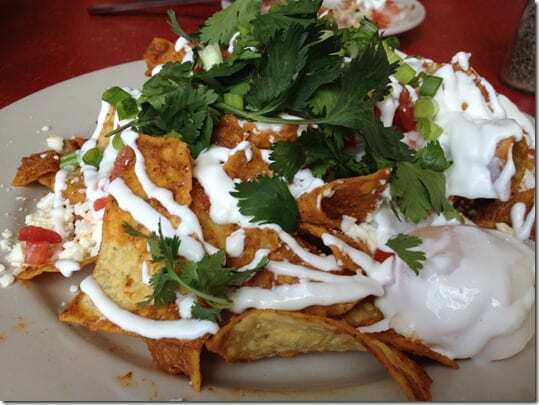 We also tried the Chilaquiles at the recommendation of Jason at The Messy Epicure. This dish was very unique, as the tortilla chips were coated then fried in salsa. And just in case that wasn’t weird enough, there were soft poached eggs to drizzle over the creation. This wasn’t my favorite dish, but my husband loved it, and was glad to take over my portion. After the appetizers, I wasn’t nearly as hungry as I wanted to be, so I only ordered a Fish Taco. Served again with another generous portion of cilantro, pickled cabbage, and chipotle cream, this was by far the best fish taco I’ve ever had. 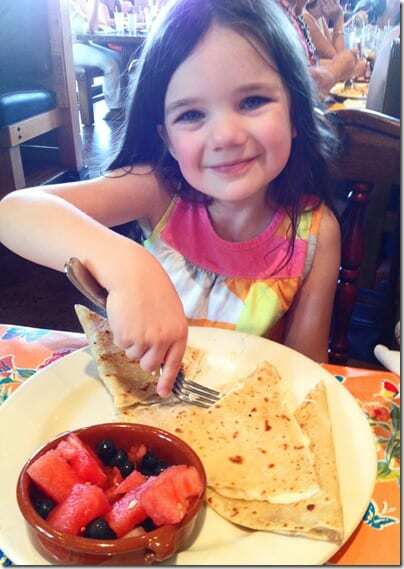 Everything was fresh and crisp and so flavorful, all set off beautifully by the divine handmade tortillas. Our service was excellent and the food was fabulous. So naturally, we were back the very next week, this time with the kids in tow. Little Donkey’s kid’s menu was also great, offering quesadillas, grilled cheese, and chicken drumsticks, among a few other options. I opted for quesadillas and grilled cheese, since I didn’t want to go to the trouble of cutting chicken off the bone. They were both hits, and the fruit was plentiful and fresh. The kid’s portions were so generous that I regretted getting each of them their own plate –they could have easily shared and still had food left over, despite their impressive appetites that day. 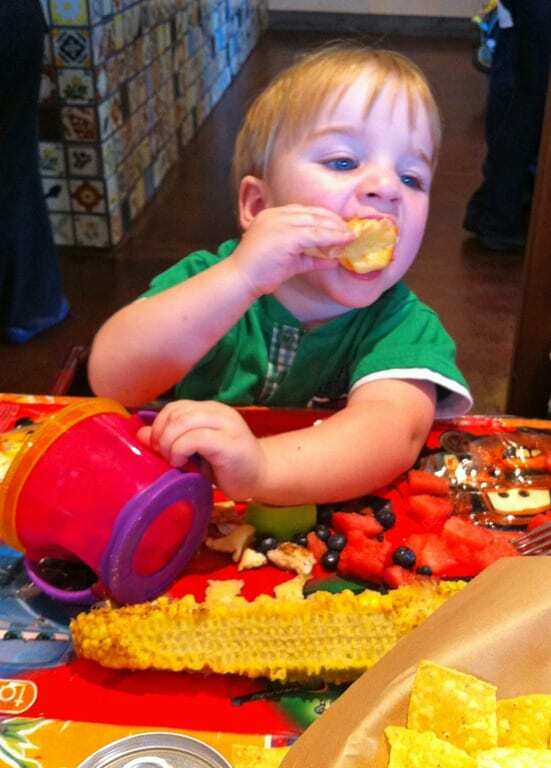 Little Donkey has definitely earned it’s place in our meal rotation – both with and without the kids.